Some Islands Don't Welcome Visitors. This tense survival horror novel is a homage to decades of nasty villains, scary predicaments, and bloody books and films. Karl Drinkwater’s debut novel fits comfortably within the great horror traditions of Richard Laymon and Dean Koontz. Turner is also available as an audio book. This book is also available in Karl Drinkwater's Horror Collection, along with They Move Below and Harvest Festival. It's the best-value option if you want all three books! "There are some truly grisly moments in TURNER. [...] I would say that TURNER is a cross between THE ISLAND OF DR. MOREAU and the “Old Gods” works of H.P. Lovecraft. There is a raw feeling to the writing, not really describing more than is necessary, yet describing enough to repulse the more sensitive among us." 5* "A fast-paced, exciting, horror-filled story that kept me surprised. This was true horror genre content - psychological, gruesome and satisfying vengeance all included! I really appreciate the choices that Karl Drinkwater made with this one; the story felt authentic, realistic and the characters believable. Tom Freeman does a lovely job with narration as well, it really helped to bring the story to life. I would recommend this book to anyone who enjoys horror!" "The opening section was genuinely chilling – a great example of the main character’s environment being just slightly off at first and then building to a climax. The prose is evocative – fantastic descriptions of the Welsh countryside. The sentence structure is superb – a very clever use of long vs. short to build and ease tension. The lighthouse scene was a classic case of one more chapter before I turn the light out (and skipping forwards a few chapters to get a sneak peak of what happens)." 5* "Excellent intelligent horror thriller. I was surprised how much I enjoyed Turner - so much so that I have written my first book review! At first glance, it looks like a trashy horror novel, but I was hooked by the audio sample, and downloaded. I was glad I did. The plot is intelligent, intriguing and very well written, with a real sense of foreboding and suspense in the opening few chapters, developing suddenly into frantic, shocking excitement, all underscored by the mystery of the island and what is behind all the horrific happenings. At the same time, the pace of the novel varies pleasingly, so I never suffered from shock-horror fatigue! It's a testament to Karl Drinkwater's writing and Tom Freeman's accomplished storytelling and characterisation, that found I CARED about the main three characters (not always the case in this genre) . Mr Freeman even manages to inject a bit of humour at times - I particularly liked his performance of the evil and more-than-slightly unhinged Lord John! An exciting, unsettling and satisfying listen." "The bright and bloody cover of the novel Turner drew me in instantly. The book was full of action, gore and gutsy characters. I loved the isolated Welsh setting and the overall atmosphere of the village. The village reminded me of Summerville Island in the classic horror film, The Wicker Man. The more gore, the better for me, and this did not disappoint. Turner would make an excellent horror film, with its twists and turns and constant action. I loved the clever use of the words ‘turning’ and ‘turner’ in the book also. Like Harvest Festival, tension builds steadily throughout the book to a horrific and shocking ending." "It’s a book with a bloody chainsaw on the front. If you’re confused about the contents of the book after that, I don’t think a review can help you [...] Turner has a horror movie feel to it. Even the opening scene feels like something straight out of a classic horror film. [...] If you’re a fan of classic horror movies, like the heart-pounding rush of escape tales, or like the “mutant evil hillbilly thing in the woods” trope, I think this book is straight up your alley!" "Turner is one fast paced, horror slasher of a read, that had me turning the pages at breakneck speed. To be honest I was thoroughly creeped out while reading this book. [...] This novel worked so well for me because of these characters. They were hugely believable and fully drawn, in a novel that for me was mainly driven via the plot. [...] It is a being scared by the seat of your pants kind of read. It is an uncomfortable read, one that quickens the pulse and makes you keep the light on. [...] Turner was a hugely refreshing read, as it also contained a psychological element, that I had not been expecting, that gave an added dimension to this novel. It helped to give it meaning. I can also see this book being turned into a movie, it most definitely had that movie vibe in the tone of language used, and pace of action. Turner really was an enjoyable read." "I'm a huge fan of Drinkwater's horror pieces and there's no exception with Turner. [...] My favorite scene involved a lighthouse; I felt my heart racing as I read and cheered at a particular outcome which I won't spoil. It's evident a huge amount of research went into writing this novel, as seen by the beautiful detail in description." "I rarely read horror books. But I'd read another book by this author and liked it so much, I thought I'd give this one a try. I'm glad I did. A great story, that kept me engaged, wanting to know what would happen next. Well-developed characters that were easy to root for or against." 5* "A novel that is equal parts The Wicker Man and The Crazies. There's an island off the coast of Wales where unwary travellers become targets, where they become hunted. We find ourselves alongside three of those travellers - a policeman, a teacher and a criminal - thrown together as they try to stay alive while crazed killers try to track them down. It's a brutal tale, full of blood and gore and grue. Think of the likes of Stephen Gallagher or James Herbert, and that's the realm we dwell in, where flawed people with imperfect motives try to make the best of a bad situation. It's certainly not for the squeamish. [...] It's a solid thrill ride as people scramble to find a way out, and maybe to find revenge along the way." 5* "This was a straight out awesome book. I loved having the story take place on an island with no way of escape. Putting characters in a place that is difficult or impossible to escape puts you immediately on edge as a reader. It reminded me of The Thing where the characters are trapped in the middle of the Arctic in a small building trying to fight off an alien. It's one of my favorite movies for that very reason. Turner does the same thing. The characters are awesome and the plot moves lightning quick. I love the mixing of Welsh and English and found myself trying to pronounce the words as I read (unsuccessfully, I think). In all, it was a good book I had a hard time putting down. Definitely a must read for horror fans." -- Bill Todd, Amazon (Slightly different review here). 5* "I started this book at eleven thirty at night, literally right after I finished watching Wrong Turn 4. At first I was wondering why I was even reading this so late and told myself just go to bed. Well now its 1:27 in the morning and I finished it about thirty minutes ago. I like horror , and I like not knowing whats going to happen even more. I can't really say what I want without adding any spoilers but I will say nothing went how I thought it was going to. This is my first book purely in horror that I've read in awhile and I'm glad I did. The writing is good and story never drags. I will now be reading whatever else this author has to offer." 5* "Turner by Karl Drinkwater is a horror story like no other. [...] The story is an attention-grabber right from the word go, and the more I read it, the harder it became to put it down. The first time I read about the village it struck me that it was like something out of a psychological horror story and, straightaway, I found myself waiting with bated breath to see what was going to happen. [...] The characters were really well developed, but were developed through the book rather than at the beginning. I like this way of writing because it adds far more to the story, giving certain events more meaning. Excellent book, and I'm looking forward to more from Mr Drinkwater." 5* "I truly loved this book. It reminded me of the feeling I got reading The Exorcist and The Omen for the first time years ago. It was straight up scary [...]. I think the atmosphere of the island gave me the largest sense of dread. Needless to say, Visit Wales would have a hard sell with me after reading this book. I hesitate to say more because the story is most effective with no knowledge of the plot ahead of time. I'm looking forward to reading more by this author." "Karl Drinkwater's debut novel of atmospheric, on the edge of your seat horror survival. [...] For me I found Turner to be a cross between the film "Friday 13th" and the TV series "American Horror Story: Asylum"; both of which I really enjoyed before I read this book, so definitely not for the squeamish! Fast paced action with every page just as griping as the previous." 5* "Turner by Karl Drinkwater. This book currently has 4.16 stars out of 5 on Goodreads with 37 ratings, and it absolutely deserves it. This has a bit of everything, from suspense, to gore, to medical, supernatural, and psychological horrors. Many parts of the book will make you think of such greats as Dean Koontz, Stephen King, and even Poe. It pays homage to the many horror stories which have come before it, while presenting itself as an original work, expertly told. Another book I would highly recommend to anyone with an interest in horror. Five stars." "I have no doubt that many horror fans will love TURNER. [...] If I had to compare TURNER to a horror movie, I would say that HOSTEL would be most like it. It has some of the suspense and character development, but it really shines with the unexpected, brutal deaths. The Welsh setting is so lifelike and fleshed out that I could almost taste the salty air. The beacon of light on top of the lighthouse seems so enticing and hopeful that not only are the characters surprised when things don’t improved when they seek refuge, but so am I! [...] Once all the chess pieces were in position, the story was intense, dramatic, and shocking. One death in particular left my jaw hanging. [...] Well-done horror is all about setting up an atmosphere of anxiety and hopelessness; TURNER smothers the reader in both in the opening chapters. It’s not ‘if’ someone is going to die, it’s ‘if’ someone will survive. [...] But man, the characters in TURNER just could not catch a break!" "It's a short, quick read. [...] It gets to the point, it delivers what you're after. [...] Check out Turner." 5* "I would like to say that for a first novel this is good, but really that would be a massive disservice to the author. It is, in my opinion, way beyond good. The author has been likened to Richard Laymon and Dean Koontz by other reviewers and these comparisons are pretty much on the mark. I cut my horror teeth on authors like Koontz and Laymon and would also put him up there with them. The atmosphere on the island is dark, heavy, foreboding. Right from the first few pages it is foot to the floor stuff with pretty much no let up till you reach the end. This is proper horror writing, the stuff that makes you wince when you see what’s coming. I predict a bright future for Karl Drinkwater and will be adding him to my list of authors whose books I pick up knowing I am in for a good read. Highly recommended – 5* (out of 5)"
"From the first page, Drinkwater’s debut novel glides the reader in with a creeping sense of dread of village inwardness and suspicion seen in ‘The Wicker Man’ and ‘An American Werewolf in London’ and pretty much every Hammer Horror film. [...] The highlight of the novel is the Lord of island, a crazed dictator whose infernal madness is explained in a way that makes everything that has happened entirely possible. If given isolation, time and the means, something the likes of this could happen in reality. Lord John is the Colonel Kurtz in all of this, he’s down the river and in charge of mindless soldiers, using psychological warfare to carve his whims upon the world. The character of Chris is also a joy. Foul mouthed and quick thinking, I had the feeling throughout that this seemed like a jumping off point and that he might easily appear in solving other strange tales as a kind of pirate/gangster Fox Mulder facing off against further weirdness in the world. From the first page this sets off in high gear and doesn’t drop down until the last few pages. [...] If you enjoy a short breakneck read with a flawed hero you be at home on this island bound book, it just isn’t the type of book to take and holiday with you. Is it?" "I was really surprised and delighted by this wee book [...] I read it in one night. [...] The book reminded me of many, many horror movies that I have loved growing up, not in a copying sense, more how you are drawn in to the creepiness and thinking oh no, do go in there or don't do that. It doesn't take long to start and the anticipation that something is about to go wrong and is eerie starts from the opening chapter. [...] I did enjoy this book, especially one part near the end of the story, I may have actually whooped out loud! [...] If you're looking for a new author to try, like stories that revolve around remote towns gone wrong, blood lust and murder then I think this might be perfect for you." 5* "A fantastic, atmospheric and truly scary debut from Karl Drinkwater that really raises the bar for other authors in this genre. Comparable with Richard Laymon, Dean Koontz and Paul Kane at their best. [...] This author has the potential to be a leading light in the future of the genre." "The immediate observation I made when reading this novel, was the incredibly graphic nature of the narrative. Never have I read so much clear and vivid depictions of everything. From action, character appearances and breath-taking landscapes. These expressive accounts of every aspect, construct a naturalistic vibe, you can almost smell the salty sea, see the cliff’s grand height and imagine the luminous lighthouse in your mind’s eye. It’s as if the writer sat in amongst the turmoil as it prevailed, noticing every tiny pixel and conveying it factually and imaginatively. [...] The actual story was flawlessly written [...] many sharp hooks reel you into this warped fictional universe. [...] Setting particular segments in the woods with ongoing storylines is magnificent. [...] with the woods being the perfect station for tension by foes being able to cloak themselves in the darkness or behind a tree. [...] Characterisation for the protagonists was superb, each having various motives for visiting the island, each creating a thirst for knowledge of their own demented histories. [...] Even towards the end we are still being fed with the pasts of some of the characters, receiving more information, bringing into existence people that are real and driven by traumatic experiences, or family mysteries, not fictional one dimensional characters. [...] Props have to go to the author for the welsh language insertions, [...] it does create an unexplainable feeling to the book, one that you cannot quite put your finger on. There are moments of pure terror hidden in this novel waiting in bated breath to paralyse you with fear. They will penetrate unknown angsts and leave a gash in your subliminal memory. [...] A tale that mercilessly tortures and whittles down your sanity then locks you in a dark room to suffer your aberrations until they destroy you. Don’t miss this one." 5* "Turner is a page turner! [...] This is a classic horror thriller. The ingredients are all here- a couple of outsiders, some strange and threatening locals and a remote Welsh island cut off from the mainland, add in some mysticism and mythology and a character with delusions of grandeur and you have an exciting read. [...] Without giving too much away, one particular scene with a lot of creative swearing was very funny and I just hope I can remember some of those expressions if I ever feel the need to taunt a psychotic character." "This was one of the best reads I've had this year, and the lack of attention it seems to get just leaves me in awe." "Creates that brilliantly terrifying fear that comes from being hunted and from not knowing why. The tension is palpable. [...] I would class this book somewhere in between horror and thriller. There is a lot of violence and gore, but it's also integral to the story - which is very much a thriller trait. [...] Make no mistake, horror is horror. And this book does horror. It will creep down your spine and tense your muscles. [...] When we're alone and in the dark, it's the monsters we feared as children that haunt the shadows. [...] This book is a fast-paced, nerve fraying, seat grabber of a story. [...] once it gets going, there is absolutely no stopping it." 5* "Scary excellent for reading on a stormy night. I loved how unpredictable the characters and situations were able to deliver surprise and thrills. Gripping page "turner" and a satisfying read. Just the right amount of squeamish blood without going overboard to the point of grossness. Definitely worth reading if you are a Stephen King fan." "Because of this book, there is a very good chance I will not wander in desolate places ever again. Being raised in an urban environment, this harrowing story about people in the wrong place at the wrong time makes me even more leery of really small towns. [...] I made it a point not to read the book when it was too dark. If you like to be scared, this is the book for you." "The book kept you on the edge until the very last word. [...] I am not usually a fan of "zombie" type books but using an unconventional hero like Turner made for a great read. Lots of blood and gore and a reminder of Island of Dr. Moreau (only in Europe). Since the Island was so sinister I kept waiting for the dog to turn into a Cujo too." 5* "This is a frightening, bloody and compelling book complete with a horde of crazed zombies, a totally insane aristocrat and a hero you really root for (I became VERY attracted to Chris Turner by the end of the book!!). Page turning gore and a rollicking good read." 5* "I love a bit of horror & have read many books in this genre over the years but never EVER have I come across anyone who could write like my horror hero the late great Richard Laymon . . . Until now that is! Karl Drinkwater is most definitely the man who can & he's got it 100% spot on! If like me, you love to scare yourself silly before bedtime then this is the book to do just that. 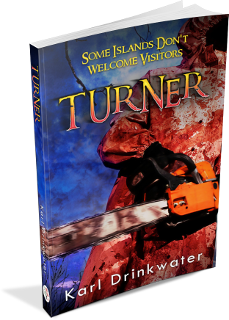 Take one remote island, a bunch of creepy inhabitants, an even creepier Lord, a chainsaw wielding madman, a couple of unsuspecting visitors - sprinkle it all with a bit of Drinkwater magic & Turner is what you get! I highly recommend this book to anyone wanting to give the old ticker a good workout. You won't be disappointed!" 5* "Author Karl Drinkwater has cost me much, including many hours of sleeplessness, blood-shot eyes, trepidation of the formerly normal noises in my own house, and a deep-seated phobia of people in red coats. I've never had any of these problems before, but since reading Turner, I've got them in spades! I have never "felt" a story as vividly as this one. From the first pages, Karl has woven a tale full of rich detail - the kind that makes you feel the exhilaration of flying down a steep road on a good bike, the eagerness to explore a new place, the apprehension at meeting odd strangers, the cold and wet of a blinding storm, and then the fear. No, wait - that's wrong. It's not fear, it's FEAR! There were times it was so intense, I had to put the book down and catch my breath. That didn't last long though; I had to know what would happen next! I highly and sincerely recommend Turner. Get your ticket for fastest-paced ride you've ever been on, and hang on tight!" 5* "A terrific read. Suspenseful. Fast-paced, but won't break your neck. A true page-turner. As a horror writer myself, I take pride in a certain level of familiarity with the types of stories that are out there. This book had me guessing (mostly wrong) the whole way through. The narrative flows with it's own voice while also giving you a sense of familiarity, certain passages reminding of the styles of Stephen King and H.P. Lovecraft." "The action never ceases and the story crescendos with each new twist or turn in plot, keeping the reader on their toes in anticipation. I enjoyed the ending and there was never a moment in the story that I got bored with it. Note: This story is not for the faint of heart. There are a couple scenes were it gets a little gruesome but if you have a strong enough stomach like me then it is not an issue." 5* "Great story. Loved the writing style. [...] If you like Stephen King or Dean Koontz, I recommend you read this book." "A solid 4.5 stars. But...Not for the squeamish! [...] the reason behind why the island's citizens are the way they are is intriguing. I won't say much more than that because I don't want to spoil anything. I will say I found myself googling pagan rites that I hadn't previously been aware. From an anthropological/historical viewpoint (which I will freely admit to LOVE reading books like this), I find books that are based on legends and belief systems from pre-history absolutely fascinating. I wish more books like this were available. After all, nearly every culture has its own version of the boogeyman, why not use them as your villain? It strikes something deep and primal." "Wow, a great book that sometimes really takes your breath away. You keep reading what's going to happen to the four non-islander 'guests'. From the beginning you know/feel that something is 'wrong' with the island and the villagers. Four complete strangers have to run for their life. Who will survive this terrible night? Who can be trusted and who doesn't? Everybody needs somebody! Do read this book if you like a thrilling story." 5* "I really enjoyed the book. It had that real, natives gone mad that I like so much. It's a classic set up. I never really felt safe reading it even though I read it sitting in a comfy starbucks chair with local police around me drinking coffee. I had to start ordering Tall Lattes because the book always made me forget to chug down my caffeine. You could say Turner works better than coffee to stimulate the mind and body. Buy it so you can kick the habit too and be as afraid of small towns as I am now." "An enjoyable dark horror set in Wales. Echoes of The Wicker Man and Texas Chainsaw Massacre combine to create a gory and fast paced read in which an isolated Welsh community conceals grim horrors." 5* "Horror (Check ), Chilling (Check ), well written (Check), Hilarious? Absolutely. This is a must read for any one who enjoy good horror writing, but also loves characters whose main reason for being alive is to make the reader pop a few laughs. I rate this one A+." "This is a chilling horror novel about the sinister goings-on on a remote Welsh island. It was gripping. I had to keep turning the page to find out what would happen to each character, and there was a nice amount of splatter. Even Nature seems to conspire with the islanders to prevent the visitors from escaping. Scary stuff. As each scene unfolded, I could easily imagine watching it on a big screen. It would make a great film. This will do, for visiting remote islands, what Jaws did for swimming in the sea."